Ann Arbor Transportation Authority board meeting (Jan. 19, 2012): The AATA board’s meeting consisted of pro forma, ordinary business set against a backdrop of several transitions. The board itself is in transition – Thursday was Rich Robben’s last meeting as an AATA board member. And the city’s transportation program manager, Eli Cooper, attended his first meeting since his nomination was confirmed by the Ann Arbor city council on Dec. 19, 2011. He replaces Sue McCormick on the board. The AATA as an organization is also possibly in transition, as it seeks to establish a new, countywide governance structure under Michigan’s Act 196 of 1986. To provide a framework for that move, AATA is asking three other entities – the city of Ann Arbor, the city of Ypsilanti and Washtenaw County – to ratify an agreement with the AATA. The Ann Arbor city council postponed action on that agreement at its Jan. 9, 2012 meeting, but is expected to take action on Jan. 23. A public hearing on the four-party agreement is scheduled for that council meeting as well. CEO Michael Ford reported that the text of the four-party agreement is currently being revised, to promote clarity. And as the AATA works on a possible move to countywide governance of public transit in Washtenaw County, Michigan’s state legislature may also act to establish a regional transit authority (RTA) for southeast Michigan that would add Washtenaw to Wayne, Macomb and Oakland counties. The AATA board got a briefing on possible upcoming RTA legislation from Dusty Fancher, a consultant for the Michigan Public Transit Association (MPTA). Fancher, who’s employed by Midwest Strategy Group, stressed that the RTA legislation – for which no details have yet been released publicly – comes in the context of a larger transportation infrastructure agenda being pushed by Michigan Gov. Rick Snyder. That larger agenda includes a focus on funding for roads. Like the move to a local countywide governance, the funding for an RTA would probably include a request to voters for additional taxes. If the state’s RTA legislation were passed before the November 2012 election – and if a decision also were made to place a ballot request to Washtenaw County voters to fund more transportation within the county – that would potentially result in two transportation tax initiatives in the same election. How likely is it that the state’s RTA legislation would be passed before the November 2012 election? Fancher said that if nothing were passed by March 2012, she’d bet money that nothing would happen before November. Also at the AATA board meeting, Clark Harder, executive director of the MPTA, indicated that it’s important to understand that Snyder does not currently have the votes within his own Republican Party to push the RTA package forward. Against that backdrop of transition and many unknowns, the AATA went about some regular business with quantifiable, known facts. The board authorized the purchase of up to 25 vans to provide van pool service. The board also authorized its capital grant program for the next five years, which allows for an additional $1.5 million of federal and state grant money to go towards the reconstruction of the downtown Ann Arbor Blake Transit Center. The board also heard its usual range of public commentary and reports from committees. Charles Griffith chaired the meeting in Jesse Bernstein’s absence. Griffith began the meeting by welcoming Eli Cooper back to the board. Cooper had served previously on the board from 2005-2008. But Cooper was attending his first meeting as an AATA board member since his most recent confirmation by the Ann Arbor city council on Dec. 19, 2011. Cooper told Griffith it was great to be back. Cooper is the city of Ann Arbor transportation program manager, and his recent nomination to a position on the board was for the city council somewhat controversial, due to his employment with the city. At the start of the Jan. 19 meeting, Griffith also noted the departure of Rich Robben from the board – that night’s meeting would be Robben’s last. Rich Robben was presented with the traditional token of appreciation from the AATA for his board service. Because Griffith was filling in for Jesse Bernstein as chair, he could not simultaneously play his usual role as the board secretary. The board’s resolutions approved at the meeting required a signature from the chair and the secretary, without those signatures being from the same person. So Griffith tapped Robben to serve as secretary at his final board meeting. By way of additional background, Robben had submitted his resignation in November 2011, but had agreed to serve through January 2012 to allow some time to find a replacement. Robben’s departure was early – his four-year term had started last year. In his resignation letter sent to mayor John Hieftje, Robben wrote, “… other factors have risen that will interfere with my time commitment to this endeavor.” Appointments to the AATA board are made through mayoral nomination, and confirmation by the city council. 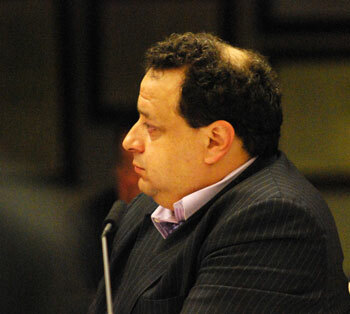 There’s been no public mention of Robben’s resignation at previous meetings of the AATA or city council. Board members queried by The Chronicle after the Jan. 19 meeting had not heard anything about who might be nominated to replace Robben. 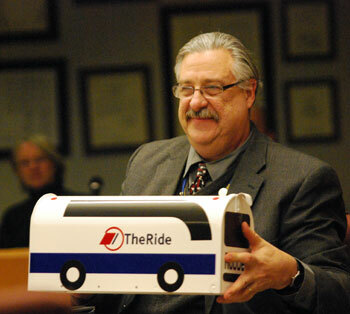 Robben received the traditional parting gift for departing board members – a mailbox marked up to resemble an AATA bus. Colleagues on the board offered their praise and gratitude for his service. The organization has benefited greatly from Rich’s stewardship and tireless service having held the chair of the planning and development committee and served on several other committees prior to PDC’s inception and also served as a U196 Board member. Rich was instrumental in the redesign of the Board structure and made a contribution to many other projects that altered the face of the organization. We will miss him greatly but look forward to continuing to come in contact through AATA’s ongoing partnership with U of M.
Griffith told Robben he enjoyed serving with Robben – they’d started on the board at the same time, back in 2006. Robben thanked his colleagues for their kind words, saying that he greatly enjoyed his time serving on the board. Robben called the AATA an outstanding, well-run organization with an excellent CEO. The board has gotten great new blood, he said. He turned to the AATA staff in attendance and literally applauded them. “You are a terrific staff,” he said, “you really are.” He said he’d enjoyed his association with them – they are on the pinacle of expertise in the transportation industry, he said. He concluded by saying he hoped he’d helped move things forward – an indirect reference to AATA’s “Moving You Forward” marketing slogan. Robben’s resignation is the second early departure from the board in two months. Sue McCormick’s last meeting was Dec. 15, 2011. Her replacement on the board is Eli Cooper, the city of Ann Arbor transportation program manager. 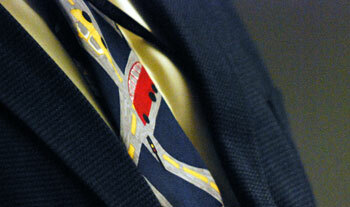 Eli Cooper sported transit-themed neckwear for his first meeting on the AATA board since his confirmation by the Ann Arbor city council on Dec. 19, 2011. Originally on the Jan. 19 agenda were items to elect new officers and make new committee assignments. Just four months ago, on Sept. 15, 2011, the board had elected new officers: Jesse Bernstein (chair); Charles Griffith (secretary); and Sue McCormick (treasurer). But with McCormick’s early departure from the board in December, the board needs to identify a treasurer. Also at the Sept. 15 meeting, the board had divided its committee responsibilities. The committee chairs were determined to be: Rich Robben (planning and development committee), and Charles Griffith (performance monitoring and external relations). So the board also needs to identify a new chair of the planning and development committee. However, the items on officers and committee assignments were pulled from the agenda before the meeting. Another role played by Robben until now was as one of three representatives of the AATA to the U196 board – the unincorporated Act 196 board. That body is a precursor to what could become a transit authority with a countywide governance – an entity that would subsume the AATA as the Ann Arbor area public transit provider. The U196 board has been meeting since late 2011. Compared to the U196 board, a fully incorporated board would include four more Ann Arbor members, for a total of seven out of 15 board seats. The need for the AATA to fill Robben’s slot on the U196 board – and to take a more active role as a entire board in the activities of the U196 – was a view expressed during public commentary delivered at the meeting by Vivienne Armentrout. Armentrout told the board she’d attended a meeting of the planning and development committee when the issue of a millage vote had been discussed. She reported that David Nacht had asked who would plan the millage vote. Ford had answered that the U196 board would do that. 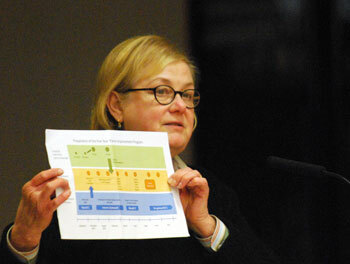 She then showed the board a diagram from the AATA showing a timeline indicating the U196 board was assigned the responsibility of planning the millage vote. Armentrout said she is concerned that the U196 board has only three AATA board members on it – one of them Rich Robben, who was departing from the board. The U196 board is really not a real board – it’s a group of very responsible people, but it’s not a real board, she said. She wanted to see the whole AATA board more closely involved, especially in the early stages of planning, as finances and millage votes are discussed. A two-volume document on funding options forms the third part of the transit master plan. [.pdf of Part 1 of Vol. 3 Transit Master Plan Funding Options] [.pdf of Part 2 of Vol. 3 Transit Master Plan Funding Options]. A financial advisory group, led by McKinley Inc. CEO Albert Berriz and retired Washtenaw County administrator Bob Guenzel, has met since late 2011 to analyze those funding options. As part of the four-party agreement, Ypsilanti and Ann Arbor would agree that AATA’s existing assets would be assumed by the new Act 196 transit authority, and they’d also agree to assign their existing millages to the new Act 196 authority. But the asset transfer and the millage assignment would be contingent on identifying a countywide funding source for the new Act 196 authority. During public commentary at the conclusion of the Jan. 19 AATA board meeting, Nancy Kaplan asked for clarification on the four-party agreement. She noted that countywide voter approval of a funding source is one of the contingencies to closing the deal. (f) Countywide voter approval before December 31, 2014, of a New TA Act 196 funding source adequate to fund ongoing operations of New TA. Any ballot question submitted to the voters of the City of Ann Arbor and/or the City of Ypsilanti shall clearly identify the new funding as additional to the existing millage. Notwithstanding anything in this Agreement to the contrary, if voters in the City of Ann Arbor fail to approve the NEW TA Act 196 funding source, regardless of whether it is approved or not by the other voting jurisdictions, then the City shall have the right to (i) withdraw from this Agreement without penalty; (ii) veto any attempted termination by AATA of the AATA-City operation agreement; and (iii) refuse to designate and/or assign its millage under Section 3(a). Kaplan expressed concern that paragraph 9 appears to give the city of Ann Arbor the right to withdraw, but does not obligate the city to withdraw, if a majority of Ann Arbor voters don’t vote for the funding source. At its Jan. 19 meeting, the board received a briefing on the state-level legislative climate for transit funding. Clark Harder, executive director of the Michigan Public Transit Association, led off the presentation by giving the board a brief history of the MPTA – a group to which the AATA belongs. Harder was followed by Dusty Fancher of Midwest Strategy Group, a multi-client lobbying firm in Lansing. What’s been fantastic about Michigan Gov. Rick Snyder, Fancher said, is that he’s been openly and publicly supportive of public transit, in a way that hasn’t been seen in a Michigan governor in many years. She said she’s worked with his policy advisors and talked to them extensively about the regional transportation authority legislation that the governor had called for in his State of the State address delivered on Jan. 18. The nitty gritty details of the bills have not yet come forward, she said. The regional transit authority is part of a much larger context of the governor’s transportation infrastructure agenda, she said, which he released in October 2011. The transportation system has been underfunded for years at the state and federal levels, she said. For every dollar sent to Washington D.C. only about 80 cents comes back to Michigan. Snyder is planning a 13-bill package to increase transportation funding overall – that includes roads and public transit, Fancher reported. What it really looks like Snyder wants to do is change the formula for funding roads. Currently road funding is based on vehicle miles traveled – that might be changed to give more money to fund state highways and less to municipalities. But every revenue package that’s been floated to the legislature so far, she said, has “fallen pretty flat” – both in the senate and the house. Legislators are wondering if the consumer who pulls up to the pump every week really wants to pay more gas taxes, Fancher explained. Universally there’s no support in the legislature for increasing the gas tax, she said. So what they’ll have to look at is the sales tax on gasoline. When you go to the pump, you’d pay a sales tax on top of a gas tax. That could be re-directed into roads. Another possibility is that the registration fees paid for vehicles will be restructured to put some of that money into the road funding formula – that’s a real possibility, according to Fancher. Some people are even talking about the Natural Resources Trust Fund and asking if some percentage of that money can be set aside and put towards roads – that idea is getting more traction than you’d think, she said. There’s still talk of increasing the statewide sales tax by one penny, and designating that revenue for roads. But that would require a statewide popular vote, Fancher said. And it would be hard to get a majority of voters to agree to increase the sales tax after many years of recession. We all know we need a bunch of money to fix our roads and make sure we have a robust transit system, Fancher told the board – it’s just not clear how we’re going to get there. Rep. Rick Olson is looking at transit funding and trying to put out a report, Fancher said. He’s met with staff of the AATA and Fancher met with him last week in his office. Olson has also put out a report about road funding – “that’s been very interesting,” she said. In the Jan. 18 State of the State address, the governor did call for Michigan as a state and for the legislature to move forward on transportation and infrastructure funding. There’s been enough talk, she said, and Snyder would like to start coalescing around some specific ideas. Snyder likes to talk about moving forward in “dog years,” she said. Fancher felt if something was not passed by March 2012, then there won’t likely be anything passed before the November elections. “I’d bet some money on that,” she said. Harder of the Michigan Public Transit Association stressed that while the regional transit authority (RTA) legislation will be introduced sooner or later, he wanted to assure the AATA that his group will not take a position on the RTA until it knows AATA’s stance. The MPTA would get the AATA’s feedback, he said, as well as feedback from other southeast Michigan transit providers. Any MPTA position would be determined by its members, he said. And if there’s a conflict, the MPTA won’t take a position. Harder noted that he and AATA CEO Michael Ford both attended an address given in late 2011 at Lawrence Technological University, when Snyder had sketched out a regional transit authority. He recalled asking Ford, “Okay, what do you think, Michael?” Harder said they’d both “kind of shrugged.” It’s hard to know until details come forth. But Harder stressed that the AATA has a very vital stake in a possible regional authority. He indicated that Washtenaw County would definitely be a part of the RTA that would eventually be proposed. 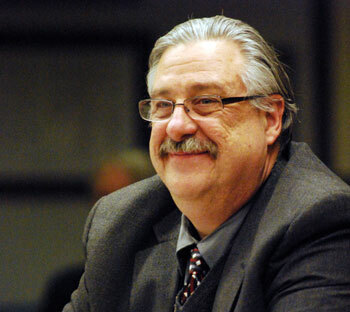 In the context of the AATA’s current effort to collaborate with other entities in Washtenaw County to establish a countywide governance for a transit authority, AATA board member Roger Kerson wanted to know if Harder and Fancher could shed light on how the regional transit authority would work. Kerson said he assumed it won’t do day-to-day operations, and that the local authority would handle that. Harder indicated that his best understanding is that an RTA will not replace or duplicate existing local systems. If there are areas where transit doesn’t currently work well, that’s an area where the new RTA would come in with some innovative ideas along some key corridors. Harder said he felt that the RTA would not be funded on the back of existing systems. We can’t afford that, he said, so more funding would be needed. It’s been explained to him this way: “This will free up dollars.” A ballpark estimate is $40-50 million, he said – though that could be off. Fancher said the number she’s heard is $100 million total – broken down roughly as $40 million for bus capital expenses, $40 million for bus operating expenses, and the rest into rail improvements. Kerson wondered about the possibility of going to voters of the proposed four-county authority – which is what Fancher had indicated the intent of the RTA legislation would be. If people have to vote on two tax increases, Kerson said, “that would not be good.” Harder said he wouldn’t want to see that – but that’s still not known. Right now, Harder said, Snyder doesn’t have the votes to move the package on the Republican side. So a lot of work will have to be done. A constitutional change would eventually have to be made, and those are not easy changes, he said. But in his State of the State address, Snyder had said transportation would be a top priority. Fancher elaborated on the fact that under Article 9 Section 9 of Michigan’s constitution, at least 90% of all transportation dollars must be directed to roads. She said that if you ask for a regional millage to support an RTA, you have to count that against the constitutional cap of not more than 10% going for public transit. It’s important to understand what the gap is between the amount of funding public transit receives today and the 10% cap – in planning for increased public funding of transit under current law, you have only that small space to work in. David Nacht wondered if the legal argument had been tried that when the feds come up with new programs, the constitutional restriction wouldn’t apply. That’s because it would apply only to those federal dollars in programs that were in effect at the time the constitution was ratified. Harder told Nacht that his idea reflected that he was thinking creatively, and the governor’s staff is thinking creatively, too. Harder concluded by saying that Snyder is prioritizing transportation and is including public transportation as a part of that. He said that even as a Democrat, he respected Snyder for his public stand. No governor since William Milliken had taken as strong a public stand for public transportation, Harder said. Some other things the AATA should be keeping its eyes and ears on include possible changes to property taxes, Fancher said. She’s trying to gauge how that will affect local transit millages. Another piece of legislation (PA 152) deals with how much you can pay for health benefits, which might impact federally funded grant programs. That legislation will be opened up again this year and transit providers might be able to get some clarification. Next week, Fancher said, the MPTA will make a presentation to the state house transportation committee at the request of its chair, Paul Opsommer, a Republican who represents District 93. It’s the first time in a decade that representatives from public transportation have been asked to present to the committee, she said. MPTA will present on what public transportation means in an urban versus rural setting, and how it’s funded in Michigan compared to other states. The following week, she said, Opsommer would like to have a discussion about bus rapid transit, perhaps bringing in somebody from Cincinnati and Grand Rapids, and the third week will focus on public transportation. She characterized it as “fantastic news” that the committee would spend the whole month of January on public transportation. It’s getting some traction in the legislature, Fancher said. Responding to the presentation from Harder and Fancher, board member David Nacht asked them to take a message back to the governor and the legislature describing what the AATA had been doing and thinking about over the last few years – which he then enumerated as follows. As agency, Nacht said, the AATA has dealt with legacy costs. “We cooperatively, with our union, put forward a fiscally sound basis for going forward, dealing with retirement issues, dealing with health care issues.” The AATA is a fiscally sound agency, he said. The AATA had not needed warning from someone else that this was necessary, but had recognized it on its own – the AATA had dealt with the issue cooperatively with its union. The AATA had solved the problem before it became a problem. Under the leadership of former board member Ted Annis, Nacht continued, the board worked with staff to focus on best practices and improving operating efficiency. Nacht described Annis as a successful entrepreneur who’d gotten the AATA to think about private sector techniques, so that even as a public agency in a unionized environment, the AATA is constantly looking at how to deliver the same level of service at a lower cost to the taxpayer. That attitude, Nacht said, is an endemic part of the AATA’s culture. Staff has been incredibly flexible, he said. “We’re proud of the culture we’ve created here,” he concluded. The AATA has cooperative agreements with the city of Ann Arbor, the Ann Arbor Downtown Development Authority, and the University of Michigan, Nacht pointed out. The AATA recognizes that people expect government to be this “one public sector thing.” People pay taxes and want problems solved. They don’t want competing public entities and turf wars – they expect people who are the beneficiaries of tax dollars to work together to solve problems. That’s exactly what the AATA is doing by cooperating with other entities, he said. The AATA has pilot-tested how to do regional commuter bus service – from Chelsea and Canton to Ann Arbor. In the beginning, Nacht allowed, the AATA didn’t know how to do it. Now, he said, “we’re doing it well.” The AATA believes in experimenting at low cost, in that case “on the federal government’s dime.” The AATA is prepared to use what it’s learned and to replicate it. The AATA works cooperatively with the private sector to deliver those services that it makes sense to deliver under the AATA’s flag, or simply cooperatively. The AATA has healthy, positive relationships with multiple private sector providers, he said. The point of his remarks, Nacht said, is say that the AATA is not a classic Mackinac Center image of a public entity – a reference to the conservative Midland-based public policy group. AATA board member David Nacht. The AATA is exactly the kind of public sector entity that “a conservative Republican would be proud to have as a public entity,” Nacht contended. The AATA has tried to be responsive to policy initiatives that come from all stripes and areas of the policy and political spectrum. “I’m really genuinely proud of our success,” Nacht said. The AATA’s transit master plan looks at best practices in Europe, the Pacific northwest, in Canada, as well as the Midwest, Nacht said. Nacht said the AATA has put a lot of effort in developing a reasonable approach to getting a fiscal reality for a plan that will improve the way people are moved around – in an environmentally sound way – and in a way that pays attention to economic development and ensures that taxpayers get the best bang for their buck. At its Jan. 19 meeting, the AATA board considered the purchase of seven Dodge Caravans (model year 2012) for $21,272 each (total = $148,904) with an option to purchase up to a total of 25 vans (total = $531,800). The vans will be used to provide vanpool services. Vanpools are arrangements in which a vehicle is provided through the service, but is driven by one of the members of the pool. At its Sept. 15, 2011 meeting, the board had authorized a contract with VPSI Inc. for vanpool services that is not to exceed $6,600 for each AATA owned/managed van. Riders pay for operational costs. Currently, the MichiVan program, operated by VPSI, provides such a service in the Ann Arbor area. However, through fiscal year 2012 MichiVan will only continue to provide vanpool service for existing vanpools in the Ann Arbor area. It is AATA’s intention to provide service for any additional vanpools that people might wish to create. Charles Griffith, who was chairing the meeting in Jesse Bernstein’s absence, noted that the performance and external relations committee had not discussed the resolution, but the analysis of the issue had been provided in the board packet. It’s been budgeted, noted Griffith, stressing that the initial purchase of seven vans is not all the resolution authorizes – it authorizes up to 25 vans. Board member David Nacht noted that while he’s in favor of piggy-backing on the state’s procurement contract, and that it’s a Michigan dealer who’d be providing the vans, it is not a Washtenaw County dealer. Nacht wanted to know if the AATA could get a competing bid from a Washtenaw County dealer for the remaining vans – “just to see how local folks compare.” Chris White, AATA manager of service development , responded by saying that it would be possible if the AATA wanted to do a separate procurement process for the remaining vans. But White noted that Washtenaw County dealers had already had an opportunity to bid – by bidding on the state contract. He also noted that in a separate procurement process, there’d be no guarantee that the Washtenaw County dealer would win the bid – the AATA is prohibited by the feds from having any geographic preference. Mary Stasiak, AATA manager of community relations, added that with this particular purchase the AATA would be able to store the vehicles at no cost. If the AATA purchased them from some alternate source, the AATA would want that same arrangement to apply. Roger Kerson, whose professional background includes time as public relations director for the United Auto Workers, got confirmation of the brand of vehicle – Dodge. “Great,” said Kerson. AATA Michael Ford clarified with Nacht that Nacht was essentially interested in getting a reconnaissance check for prices from local dealers. Outcome: The board voted unanimously to authorize the purchase of up to 25 vans to provide vanpool service. The resolution considered by the board authorized AATA’s capital and categorical grant program for 2012-2016. [.pdf of capital and categorical grant program] To continue receiving federal and state funding, it’s required that the AATA develop such an annual plan for use of federal and state funds. The board had authorized a revised version of its 2011-2015 plan last year on Aug. 24, 2011. That revision was made in order to accommodate three projects: (1) the Blake Transit Center (BTC) reconstruction in downtown Ann Arbor, (2) the bus storage facility expansion, and (3) the bus maintenance facility upgrade. This year’s program also includes those projects. The resolution adopted by the board at its Jan. 19 meeting includes an additional use of grant funding of up to $1.5 million – $1.2 million in federal formula funds and $0.3 million in state funds – for the planned reconstruction of the downtown Ann Arbor BTC. That brings the total BTC project budget from the previously reported $5.5 million to as much as $7 million. The AATA does not think it will be possible to construct the center’s design for $5.5 million, but the board is not necessarily committed to spending the entire $7 million. Some of the additional cost involves technology for informational displays. The resolution considered by the board on Jan. 19 set that additional funding as the final maximum amount for the planned BTC reconstruction. During the report from the planning and development committee, board member David Nacht noted that when it comes to the BTC financing, Rich Robben had previously asked serious questions about the cost. Nacht said that while Robben did not attend the most recent meeting of that committee, Nacht had followed up on those questions. He described the AATA staff as well prepared – they’d given him and the other committee member, Anya Dale, a comfort level that’s good enough to go forward. When it came time to deliberate on the capital and categorical grant program, Nacht described it as something the AATA does every year – it’s following an established procedure. Nacht noted that the AATA has some flexibility to re-program funds, but the way the program is set out is consistent with the transportation master plan. Nacht stated his feeling that they were being rational about the grant program, therefore it should be done. Outcome: The board voted unanimously to authorize the capital and categorical grant program for 2012-2016. Also considered by the board was a resolution that authorizes its CEO, Michael Ford, to submit applications, certifications and assurances to the Federal Transit Administration (FTA), when the AATA asks for funding from that agency. The FTA requires the AATA to have passed such a resolution. The board’s resolution also authorized the CEO to execute contracts with the FTA on behalf of the AATA. When it came time to vote on the resolution, Charles Griffith – who was chairing the meeting in the absence of Jesse Bernstein – described the resolution as fairly pro forma. Chris White, AATA manager of service development, described the resolution as the same one that has been on file, with the title of the AATA’s top executive changed from “executive director” to “chief executive officer” – to reflect accurately Michael Ford’s title. Outcome: The board voted unanimously to authorize submissions of materials to the FTA by its CEO. At its Jan. 19, 2012 meeting, the board entertained various communications, including its usual reports from the performance monitoring and external relations committee, the planning and development committee, as well as from CEO Michael Ford. The board also heard commentary from the public. Here are some highlights. AATA controller Phil Webb gave the board an update on the first quarter financials. For the first three months of the fiscal year, which began Oct. 1, 2011, the AATA is under budget for both revenue and expenses, Webb said. Chris White, AATA manager of service development, noted that the performance and external relations committee had not met in the previous month, so it had not reviewed the operating performance statistics. He described December as a historically low ridership month. He also observed that the cost per service hour is up from last year. So far this year, the AATA is operating at $105.18 per service hour, which is under its $112.30 budget, but more than the $100.17 per service hour it showed last year for the same period. The on-time performance, White said, continues to improve somewhat. He noted, however, that the impact of the East Stadium bridge closing was significant. Routes 6, 5 and 36 were only about 60% on time. It had been even worse when State Street under the bridge was also closed. Now that State is open again, things are somewhat better, White reported. In his oral update to the board delivered at the board meeting, CEO Michael Ford reported on the north-south commuter rail project, which would connect Howell and Ann Arbor. [It's called WALLY – Washtenaw Livingston Rail Line]. Ford stressed that it’s currently not a viable project without the TIGER III funding that had been hoped for. It’s very clear that nothing is going to move forward without that capital funding. Michael Benham [strategic planner for AATA] reported on issuing a Request for Proposals for Station Design Service for the WALLY project. Proposals are due near the end of January. David Nacht questioned the work, noting that the committee previously had directed staff to seek approval prior to conducting further work on the WALLY project. Benham noted that no funds were yet to be expended and indicated that a plan for moving the project forward would be provided in February or March. Benham also indicated that the funds for the station design project would be covered with funding obtained from a Section 5303 grant, the City of Howell, Washtenaw County and the Ann Arbor DDA. Benham added that he was in touch with his counterpart at MDOT, and once the revised business plan was complete, he would arrange a meeting to assess the current commitment from the State. Mary Stasiak, AATA manager of community relations, gave an update on development of the new website. She said that one of the things the AATA has been working hard on is the design. She wants to make sure it’s something the AATA can be proud of. She allowed that these days, websites are changing all the time, but the AATA doesn’t want to be unhappy with the design a year down the road. She described how people had been surveyed, both online and in person, about proposed designs. Stasiak said she expected the final design template to be done in the coming week. When data is loaded into the template, and the pages are built out, she noted that more user testing would be needed. In his update to the board, CEO Michael Ford described the response he’d made to some complaint about the AATA’s paratransit service (A-Ride) with respect to the policy on the number of bags and some complaints about the quality of vehicles. He reported that he’d personally ridden in some of the high mileage vehicles used by SelectRide, the AATA’s contractor for the service, and found no problematic issues. They showed usual wear and tear, but were clean and acceptable, Ford reported. In her update from the AATA’s local advisory council (LAC), Cheryl Weber noted that the council had discussed how packages are carried by A-Ride and fixed-route riders. The council has formed a committee to look at that issue. The board had discussed the issue at its Dec. 15, 2011 meeting – they’d been addressed by a visually-impaired rider at the previous month’s meeting who’d been denied a ride for having too many bags. Clark Charnetski introduced himself as a member of the AATA’s local advisory council (LAC). He’s also a member of the Suburban Mobility Authority for Regional Transportation (SMART) advisory council. SMART’s council meets four times a year – but in December 2011 the meeting cancelled due in part to a failure of coordination between SMART and the Detroit Department of Transportation (DDOT). It goes to show what happens if you don’t have a good regional system, he said. He told the AATA board he’s glad they’re working on a good regional plan. He said he hopes there are not too many entities that opt out of joining the Act 196 authority. For SMART, many communities had opted out that have major health centers and educational institutions. He stressed the importance of the transportation system being done on a countywide basis. During public commentary, Ethel Potts commented on the general item of planning, saying that she used to attend AATA meetings in the past. Describing a 5-year improvement plan for 1990-1995, she said not everything had been implemented from that plan. Park-and-ride lots were one such item that had not been completely implemented, she said. She allowed that it is difficult to find land to establish park-and-ride lots. She acknowledged that the AATA had constructed a park-and-ride lot near US-23 and Plymouth Road, but contended that in order to provide bus service to the lot, the AATA had to remove other service. Speaking to the proposed four-party agreement for countywide transit, Potts said she would prefer to “shape up” Ann Arbor’s system first. Ann Arbor’s transit system is very good, she allowed, but it’s still not good enough in light of the plans AATA has had in the past for a better system.